Advanced TV enables you to deliver messages and connect with your target audience in a deeper, more meaningful way than traditional TV. 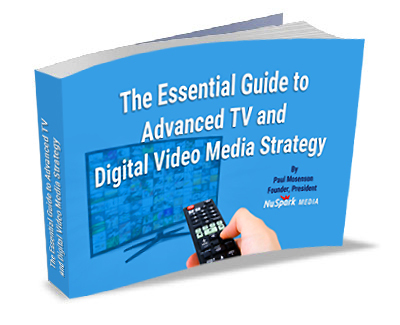 Comprising addressable TV, connected TV, programmatic TV, TV Everywhere, and Video-on-Demand (VOD), it also includes everything from streaming to interactive TV. Going way beyond the basic demographic targeting of traditional TV, advanced TV allows you to target specific households based on granular consumer data. Also, it enables direct measurement of actions taken, such as sales and foot traffic, after seeing an ad campaign. Thus, it is data-driven, addressable and accountable. At NuSpark Media, we bring pinpoint accuracy of digital advertising to television. The result? A media program that reaches your viewers wherever they are, however they’re watching and on whatever device they’re using. TV Everywhere (TVE) is an online business model in which cable companies allow their customers to access live or on-demand video content from their networks through internet-based services. The fee for such access is covered as part of their subscription to the service, via a multi-channel video programmatic distributor (MVPD). To access content, viewers use credentials from their MVPD. Examples are HBO GO, WatchESPN, and Xfinity Stream. Addressable TV refers to the ad inventory available through cable (set-top box) providers, such as Time Warner and Comcast, companies that can present your messages through their linear programming or VOD inventory. Advertisers can target individual households using first and third-party data. The primary reporting metrics are site activity, brand lift and sales. OTT devices, such as Apple TV and Roku, or Smart TV sets, (those that are connected to the internet) deliver connected TV. Connected TV provides you with targeting and measurement capabilities such as digital channels. It has a reach of more than 50 million US households with geo-targeting at the ZIP code level. When you buy inventory on an impression basis using automation, it’s called programmatic TV. Instead of utilizing ratings and Gross-Rating Points (GRPs) against a demographic to measure delivery, it uses set-top-box (STB) data to identify a particular audience. You programmatically purchase TV spots targeting this audience. VOD is video content that the audience can consume whenever they like after its official release date or original airdate. VOD content can be found on set-top boxes, OTT devices, mobile web, mobile apps and video streaming services. As marketers seek a greater ROI and measurable outcomes across campaigns, interest in and capabilities of advanced TV will grow exponentially in the future. At NuSpark Media, we’re keeping an eye on developments so we can share media opportunities that will maximize your success.